(?) Garman married Lisa Houghton, daughter of Richard M. Houghton and Nancy Sherman. Lois Lucile Rocher married Francis Barnwell Houghton, son of Charles Hazelton Houghton and Belle Sarah Wharton, in Nov 10, 1945 at Duval, FL, USA. Reta (?) married Frank Barnwell Houghton Jr, son of Francis Barnwell Houghton and Lois Lucile Rocher. (?) Enis married Ruby Houghton, daughter of Elmer Henry Houghton and Mabel Little. (?) O'Neil married Barbara Louise Houghton, daughter of Elmer Henry Houghton and Mabel Little. Theron D. Houghton married Peggy Lee Coburn in Nov 16, 1966. 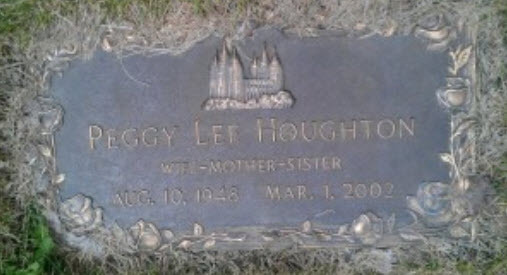 Peggy Lee Coburn married Theron D. Houghton, son of Donald Max Houghton and Reva Nell Cassity, in Nov 16, 1966. Catherine V. (?) married Jeffery Theron Houghton, son of Theron D. Houghton and Peggy Lee Coburn. Nila Jo (?) married Donald Randall Houghton, son of Theron D. Houghton and Peggy Lee Coburn. Reva Nell Cassity married Donald Max Houghton, son of Lyman Carter Houghton and Mary Ellen Lofgran, in Nov 22, 1947 at Elko, NV, USA. Gordon Houghton married Dorothy M. Gappelt. Dorothy M. Gappelt married Gordon Houghton. Clint McCoy married Terra Houghton, daughter of Susan Ann Houghton. Sandra Houghton married (?) Hill. (?) Hill married Sandra Houghton, daughter of Richard Burdette Houghton and Anne Plowden.